As little as three teaspoons of fluoride is a lethal dosage. Fluoridation has been attributed to severe skeletal deformations, mental retardation, dental fluorosis among other severe health problems. Fluoride is ranked just below arsenic and just above lead in a scale of most harmful toxins. Fluoridation does not just mean the adding of fluoride to our water supply, it comes with a compound of other chemicals – including traces of mercury, lead and arsenic! Fluoride is INDUSTRIAL WASTE and the people of Geelong do not need this in our water! Tonight, hundreds of people showed up to a campaign launch by the Barwon Association for Freedom from Fluoridation (BAFF) to issue a mandate to Parliament demanding a complete halt to the fluoridation of the Greater Geelong region. 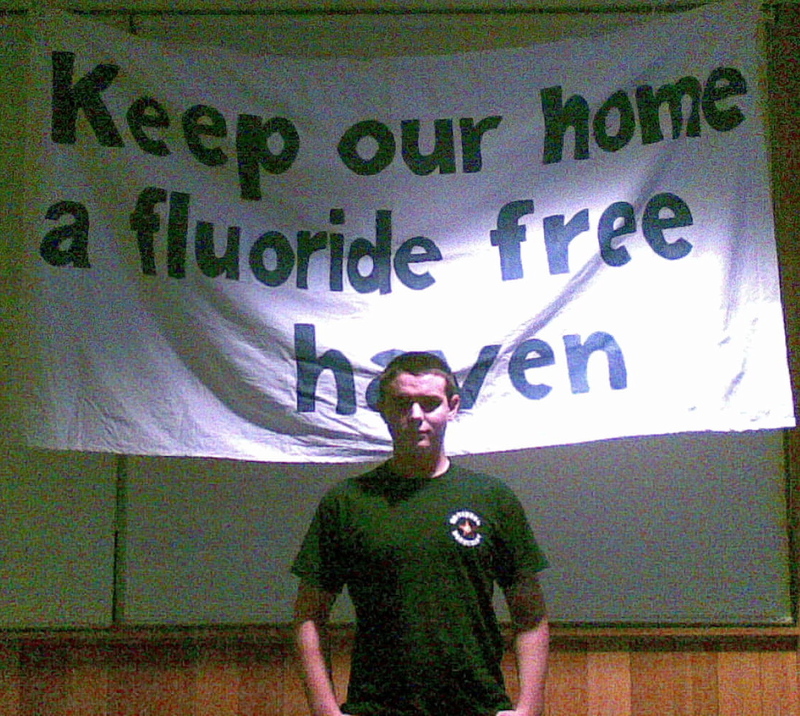 As supporters of the anti-fluoridation campaign, supporters of the communities right to choose and as potential victims of fluoridation; local National-Anarchists attended the meeting and look forward to being involved in the ongoing campaign. Though the Geelong National-Anarchists are not scientists and we’ll leave the arguing of the health effects of fluoridation to the experts; we will demand our FREEDOM TO CHOOSE! We demand the freedom to decide what chemicals go in to our bodies. We deserve to have access to clean water, free from potentially harmful chemicals. We do not need government or anybody else trying to decide what we need to remain healthy, we can medicate ourselves! The people of Geelong deserve to be heard and to be consulted on what happens in the Greater Geelong region. There has never been a call from the community for fluoridation but there has always been a large body voicing their opposition! Despite MPs such as Bronwyn Pike saying Geelong will not be fluoridated unless Geelong wants to be fluoridated, the lies have once again prevailed and State government intends on legislating against the will of the people. Such lies are not new and those involved in this campaign that may be new to political activism will soon learn that Parliament, the Judiciary and all “public servants” do not have the interests of the community at heart! The Geelong National-Anarchists will be involved in this campaign and we encourage all of our readers, supporters and opponents to do the same. This is not about politics but about health and freedom in our society! It’s only been a short few years since National-Anarchism appeared on the Australian scene as a radical social alternative to global capitalism. The introduction of National-Anarchist ideas was fairly low key – mostly by word of mouth and friends telling friends about various websites and articles. In a very short time a number of people, some long-time activists and others fairly new to politics began working together to build a National-Anarchist movement. The network since has participated in many activist projects and demonstrations, as well as working with and helping other groups in various activities. In this article I will take a look at the different things the National-Anarchists have achieved and what we hope to achieve in the future. The idea was to offer a nationalist perspective on globalisation and capitalism, an alternative that did not mean just another brand of internationalism. The National-Anarchists had worked with the New Right and various nationalist activists in the lead up to the demonstration. The activists, many from different backgrounds and sometimes differing ideologies came together to march as a black bloc against the global elite exploiting people in the name of profit. Needless to say, the dogmatic elements of the left didn’t want to share what had for so long been a monopoly of public protest – our activists were abused for hours but stood their ground. The APEC rally was the first time in years that tribalist and nationalist activists organised at a large scale demonstration in Australia. Not all of those present were National-Anarchists but since that day, the dogmatic left have targeted National-Anarchism as a threat to their control of radical politics. After APEC the goals were to network amongst other activist groups, meet and talk to people not yet familiar with National-Anarchism and promote our ideas through different mediums. 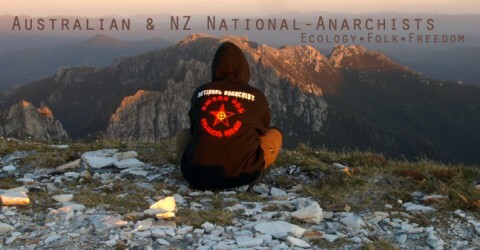 National-Anarchists made contacts with many relevant groups; including political lobby groups, environmentalist groups and ethnic social clubs. The key to moving forward is to make contact with and work with those with similar aims and values as your own group – the networking principle. In March of 2008, a handful of National-Anarchist activists attended the annual Inverell Forum in lovely NSW. The activists came from all over the country and drove up to share National-Anarchist ideas with the wide variety of people in attendance. Many people were interested in what we had to say and many fliers were handed out, along with publications bought. Inverell is definitely a sign that free speech is not dead in Australia. A project of great scrutiny and contention was the National-Anarchist Asia Tour. The extreme right declared us commies and “race traitors” for even daring to visit the homelands of what they deem “subhumans.” The left were utterly confused as to why National-Anarchists whom they deem “nazis” would consider going to spend time in South-East Asia. The National-Anarchists advocate a natural and autonomous existence, contrary to the materialist and culture-less society the West is becoming. We see those living in the “third world” as being more at one with their own identity and more independent of global capitalism – National-Anarchists went there to learn from their example. The lessons learnt were significant – South-East Asians are as much a victim of corporate media and advertising as the West, the best way to fight capitalism and globalisation is to stay close to your own community and cultural identity, mass migration to the West from other countries is the fault of global capitalists rather than the migrants. Much of what was learned on the trip could have been taught from a book but being there, living and conversing with the inhabitants made it so much more revealing. The National-Anarchists advocate cultural self-determination and autonomy as an integral part of our movement. The treatment of the Tibetan people by the Chinese Communist Party was one of colonisation and imperialism through mass immigration. Thousands of Han Chinese were being sent in to Tibet, displacing indigenous Tibetans while the CCP eliminated Tibetan rights, even exiling their spiritual leaders. The Tibetans fought back against the incredible force of the CCP, often being killed and arrested as a result. Tibetan activists intended on demonstrating in Canberra during the Beijing Olympics torch relay, similar to other Tibet protests around the world. Thousands of pro-CCP activists intended on attending in response to the Tibetans. The National-Anarchists would also attend! On the day, a few hundred Tibetans were in attendance, facing twenty thousand CCP activists – mostly Chinese Australians and international students. The Chinese demonstrators harassed and bullied the Tibetans, in a similar fashion to the CCP at home. The National-Anarchists were quick to defend the Tibetans, even showing solidarity by standing behind the same banner. Cultural self-determination is a right the National-Anarchists will fight for! The Marxists have held workers rights rallies on May Day in Australia for decades, their monopoly on workers issues had to end. The National-Anarchists attended this rally in solidarity for Australia workers against corporate greed. Not long after arriving, a socialist thug was quick to make threats and bully the activists for turning up. It seemed demonstrating in the name of workers rights was only okay if you were accepted by the Marxists – we did not agree. Inevitably, the militant and revolutionary Marxist had the police remove our activists from the demo. The rest of the day was still productive, we spent some time at Docklands speaking to young people about various issues and ideas. Plenty of National-Anarchist stickers were put up around the place and many photos were taken. Politics is not just attending a few rallies, political activism is spending time every day spreading the word and making a difference. In between frequent sticker campaigns, social get togethers and all the personal work that goes in to radical activism, a small band of National-Anarchists have been planting gardens. The gardens are in various places – in three major cities, various suburbs around the place and some even on abandoned property. The gardens are relaxing, tending to them together is great for team bonding and the food they produce are organic and delicious! The gardens may be a small part of our activism but the fun and teamwork that goes in to it makes it some of the most rewarding. More recently, in response to Senator Conroy and his calls to filter the internet a public movement has formed in opposition. The National-Anarchists attended one of these rallies in December of 2008, holding a placard calling for free speech against censorship. The fight against internet filtering continues and so the National-Anarchists will continue working with those involved and attending rallies to fight against the proposal of Government deciding what Australians can and can’t see on the internet. This is only a small summary of what we’ve achieved since APEC 2007. Obviously much goes on behind the scenes that is just as significant as what happens in the public eye. We are trying to become the most active radical movement in Australia, while being one of the youngest this will be a mean feat. If you find National-Anarchism to be appealing to you and wish to become involved in activism like I’ve described above, please do contact us and get involved. In 2009 and beyond we plan more publicising of information, more leaflets and booklets to be made available, we are planning more rallies and public activism. There is nothing we cannot achieve when we have the dedicated people and determination to make a positive change in the world. Keep up to date with our activities and if you’re not yet, GET INVOLVED!